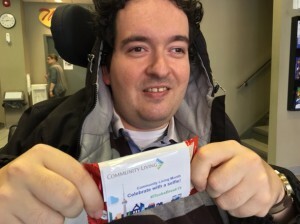 Community Living month, celebrated in May each year, is a time for us to celebrate people with intellectual disabilities and people like you who are supporting the mission of building inclusive communities. 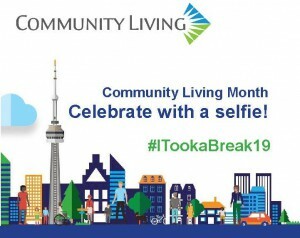 On Monday May 6th, Community Living Toronto will be hosting our annual social media campaign, #ITookaBreak19. We hope you will join us in “taking a break” from your work day to show your support for a society where everyone belongs. May 6th is also Community Living’s annual Day at the Legislature. Representatives from developmental services agencies will gather at Queen’s Park to raise awareness and promote #ITookaBreak19 with MPPs and government staff. Not heading to Queen’s Park? To participate you will need to purchase a KitKat Bar, and then download the wrapper [here], print it, and then tape it around your KitKit bar. 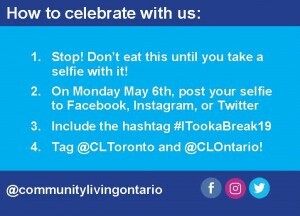 Then on Monday, May 6th, you’re invited you to “Take A Break” with us, snap a selfie with your KitKat and post it on social media (Instagram, Twitter, and Facebook) using the hashtag #ITookABreak19. Thank you for your continued advocacy on behalf of Ontarians with an intellectual disability, their families and the organizations that support them. 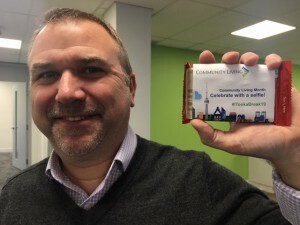 We look forward to seeing your #ITookABreak19 posts on May 6th! CEO, Brad Saunders with his #ITookABreak19 selfie!